With fall on the horizon, I thought it might be nice to have a lighter weight shawl to help cover up when the chill hits the air. I wanted something that would look good with a variegated yarn and wasn’t going to tax my brain. I chose to make a shawl that is made up of a three row repeat and can be done with any size hook and yarn combination. It’s light, lacy, and lays well across the shoulders due to the slight flaring at the edges. I’ve already been using it when the AC is a bit too cool for my liking. Gauge: Gauge is not significant in this design. Just choose a combination of hook and yarn that you like! Note: This pattern can be done to any size with any hook and yarn combination. It will grow by about a third during blocking. The V-st and Shell stitches will be counted as one unit. Do not count the “legs” when skipping stitches. Turn work at the end of each row. Foundation: Ch 4. In 4th ch from hook, work (dc, ch 2) 4 times, make 2 dc in same stitch. Row 2: Ch3, dc in next st. (Ch 2, V-st in next st, ch 2, dc in next st) 4 times. Dc in turning ch. Row 4: Ch 3, dc in next st. (Ch 2, dc in ch-2 sp, ch 3, sc in shell sp, ch 3, dc in ch-2 sp, ch 2, dc in next st) 4 times. Dc in turning ch. Row 5: Ch 3, dc in next st. (Ch 2, V-st into next st, ch 3, sc in previous row’s sc, ch 3, V-st in next st, ch 2, dc in next st) 4 times. Dc in turning ch. Row 6: Ch 3, dc in next st. (Ch 2, shell into ch-2 sp of V-st, ch 3, sc in previous row’s sc, ch 3, shell into ch-2 space of V-st, ch 2, dc in next st) 4 times. Dc in turning ch. Row 7: Ch 3, dc in next st. (Ch 2, dc in ch-2 sp, ch 3, sc in ch-2 sp of previous row’s shell, ch 3, dc in sc of previous row, ch 3, sc in ch-2 sp of previous row’s shell st, ch 3, dc in ch-2 sp, ch 2, dc in next st) 4 times. Dc in turning ch. Row 8: Ch 3, dc in next st. (Ch 2, V-st in next st, *ch 3, sc in sc of previous row, ch 3, V-st in next st. * Work * to * twice, ch 2, dc in next st) 4 times. Dc in turning ch. Row 9: Ch 3, dc in next st. (Ch 2, shell in ch-2 sp of V-st in previous row. *Ch 3, sc in sc, ch 3, shell in ch-2 sp of V-st in previous row. * Work * to * twice, ch 2, dc in next st) 4 times. Dc in turning ch. Row 10: Ch 3, dc in next st. (Ch 2, dc in ch-2 sp, *ch 3, sc in ch-2 space of shell st in previous row, ch 3, dc in sc of previous row. * Work * to * twice, ch 3, sc in ch-2 sp of shell in previous row, ch 3, dc in ch-2 sp, ch 2, dc in next st) 4 times. Dc in turning ch. Row 11: Ch 3, dc in next st. (Ch 2, V-st in next st, *ch 3, sc in sc of previous row, ch 3, V-st in next st. * Work * to * 4 times. Ch 2, dc in next st) 3 times. Dc in turning ch. Row 12: Ch 3, dc in next st. (Ch 2, shell in ch-2 sp of V-st in previous row. *Ch 3, sc in sc, ch3, shell in ch-2 sp of V-st in previous row. * Work * to * 3 times. Ch 2, dc in next st) 4 times. Dc in turning ch. Continue repeating rows 10-12 adding two additional repeats of the * to * section per section of shawl. You will be adding in 2 new “motifs” per section every fourth row. Final row: Ch 3, dc in next st, ch 2. *(Make 3 dc, ch 2, make 3 dc) in ch-2 sp of shell in previous row. Ch 3, sc in sc or dc spine of the previous row, ch 3. * Work * to * across row to last shell stitch, (make 3 dc, ch 2, make 3 dc) in last shell. Ch 2, dc in last two stitches. Finish off. Finishing: Weave in ends, block as desired. Cheri is a stay at home mother to a three year-old and two black labs. She has been designing for almost 2 years and is really enjoying the whole process. She hopess to continue designing for many years to come! What a cute pattern! Cannot wait to make this one. Looks like a fun great pattern! I too can not wait to make this! Thanks for posting it! This is gonna go on my ‘to do’ list today! I love it! Thank you! Thanks for sharing this beautiful pattern. It will suit my needs perfectly. 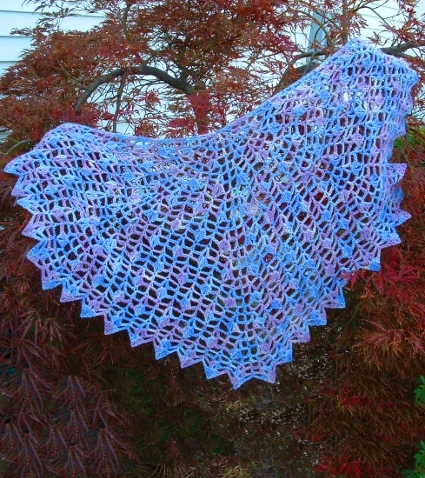 Thank you for sharing – I’ve been looking for a light shawl pattern for my sister-in-law, and this is beautiful!! This is absolutely beautiful! I think this solves my question of what to make for my boss for Christmas! 🙂 Thank you so much for sharing the pattern. Simply beautiful!!! I love this! Thank you for sharing your great talent with others like me. This is very beautiful.. thank you for sharing it with us! I’m going to make it for my mother in law for Christmas! Thanks again and I look forward to seeing more of your work. Have a great day! This is what I have looked and looked for. I can’t wait to get started on it. Now to decide on the yarn to use and color. I don’t know which is more fun . . . deciding on the pattern or deciding on the yarn and color to use. Thank you for sharing this. And Cheri, thank you for designing the pattern! I can’t wait to get started on this! I am the activity director of Gray Health and rehabilitation in Gray Georgia and I am going to make several of the shawls for Christmas presents for my residents. If any one wants to crochet some and mail them to me I have many residents who would appreciate them. You need to recheck your pattern directions; row 6 makes no sense. Please disregard last night’s comment; I wasn’t paying attention and tried to do row 6 twice :/. I found this pattern a bit hard to follow I think because the foundation row I see as row 1. I have worked almost 10 rows, doing this in two colors, and it is gorgeous. I am planning on making these for the hospice that is helping my Dad; very therapeutic and I hope the other patients love them as much as I love making them :). Thank you for offering this pattern; it is so unique. im eager to see this one up close. Oh my Goodness this is beautiful, I’ve been crocheting since I was 10 am 51 in oct. And I saw this pattern can’t wait to try it. How do you print the pattern? I do not see any place to print this wonderful scarf that I hope to make for rest home residents. Hello Alice. You should be able to print the pattern using the system dialog on your web browser; it’s set up to automatically remove much of the website formatting when printed. I lost my son, my only child, last December. I joined a parent support group. The butterfly is their symbol! THANX so much for this design! I LOVE this shawl! It was easy and turned out beautifully. I used Simply Soft and a J hook for a slightly more loose drape. Thank you so much, Cheri, for the pattern! 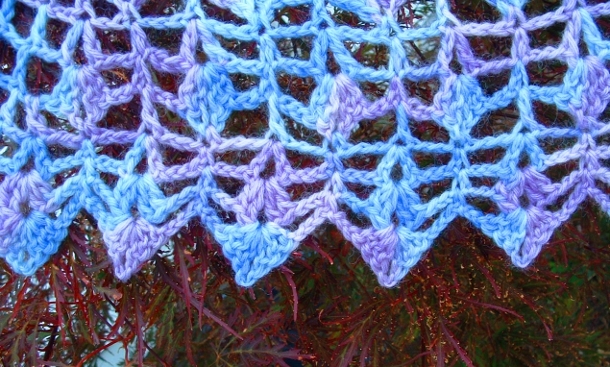 WARNING…..this is a beautiful shawl, however there is a major error!!! Fortunately, I am an experienced crocheter, and was able to figure this out. However I did waste a considerable amount of time, not to mention some delicate expensive yarn which does not like to be ripped/reworked. Martha, thank you! I am on row 11 and was thinking that the * to * instructions could only be repeated 3 times. As i am sitting here working this pattern I have learned something, in the beginning of the foundation round when it ends with 2 dc in same stitch, it requires one instead of two, and as you go through the rounds when it says to repeat four times, three times is the max you can do, even if you had tried doing the two double crochets at the end of the foundation round. I am a beginner at crocheting and I was wondering… in the first step, how do you crochet the 4th stitch from the hook? Do you crochet it into a ring? or do you just leave it as a regular row? WOW! I just found your patterns and I wanted to say you create BEAUTIFUL works of art! I cannot wait to try one of your shawl patterns. I’m just over here staring at them. So so gorgeous! Thank you! Hello, your design is so beautyful.. I love it. But I have a question already: Am I allowed to translate your very nice design in german language and post it in an facebook group? There are some people that like to make a shawl from your design, but only speaking german. (I know, my english is horrible too). Hugs and greetings from germany!